Commands are the mechanism through which players interact with a scene. Examples include Examine, Give, Pick up, Talk to, and others. 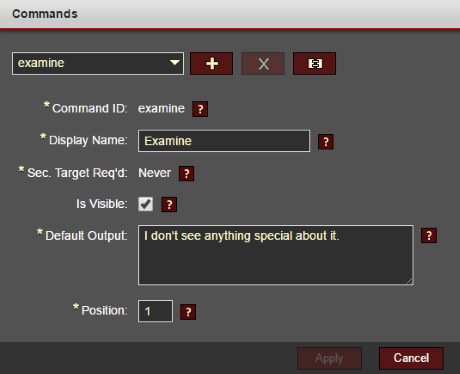 The Commands editor (pictured below) lets you determine which commands are available for your app. Enables the automatic addition of items to the character's inventory. Enables the automatic transfer of items from the active character to the target character. Enables the triggering of conversations. Enables the ability to switch between characters. Note: if enabled, this command is only visible when there are two or more playable characters. If none of the predefined commands meet your needs, you can add your own custom commands. Custom commands can use whatever verbs you choose (e.g. Eat, Punch, Shoot), but if any special behavior is required you'll need to create scripts to accommodate it.